Secretary of State John Kerry underwent successful surgery on a broken leg and will be walking soon, his doctors have announced. He flew to Boston on June 1 after staying overnight in a Swiss hospital to receive treatment for a broken leg incurred in a bicycle crash. John Kerry, 71, was injured in a biking accident in the French Alps last week. Surgeon Dennis Burke said the operation went well and John Kerry should make a full recovery. “I do not anticipate this will interfere with his duties as secretary of state,” he added. Dr. Dennis Burke said John Kerry was conscious throughout the four-hour operation, which took place under local anaesthetic. “The procedure was uncomplicated, the fracture was fully repaired, and we plan to get him up walking on Wednesday,” he said. John Kerry had been attending talks in Switzerland over the future of Iran’s nuclear program prior to the accident. It happened some 25 miles south-east of the Swiss border in Scionzier, France. 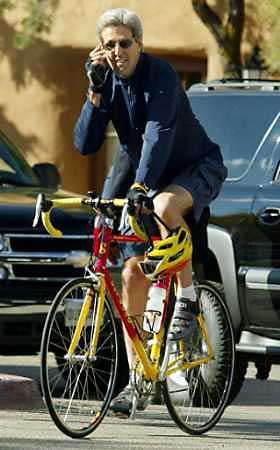 John Kerry, who is a keen cyclist, is believed to have hit a kerb before falling off his bike and fracturing his right femur. Shortly before undergoing surgery John Kerry phoned in to address a high-level conference in Paris, about the ongoing Islamic State crisis. He had planned to attend in person but was forced to cancel. He also pulled out of a visit to the Spanish capital Madrid. White House spokesman John Earnest said John Kerry would “approach his recuperation and rehabilitation with uncommon zeal” and would work to shorten his recovery time. John Earnest said he remained “confident” the secretary of state would “play a leading role” in the Iran nuclear negotiations as the June 30 deadline for a deal looms.